After the symphony of seafood at Le Bernardin, it was time to sample the food of award-winning chef Jean-Georges Vongerichten. Though Vongerichten was born, raised, and trained in France, his cuisine is perhaps most notable for its Asian influence, a result of his many years spent cooking in Asia. From this, Vongerichten established his philosophy of "vibrant and spare cuisine," or cuisine that eschews traditional meat-based stocks for the clarity and power of fruit-, vegetable, and herb-derived juices, oils, and broths. 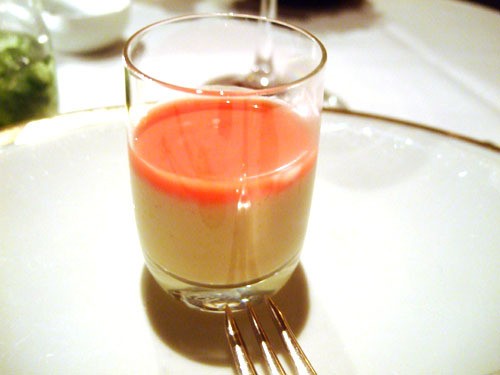 As a result, Jean Georges features an approach to fine dining that blends this mantra of "light intensity" along with French, American, and Indochinese ingredients and techniques. It would be interesting to see how Jean Georges holds up, given that Vongerichten's attention is now spread over such a vast culinary empire. He commands no less than 18 restaurants throughout the world, concentrated in New York. In addition to his flagship Jean Georges, Vongerichten also maintains JoJo, Matsugen, Mercer Kitchen, Nougatine, Perry St, Spice Market, and Vong in the City. 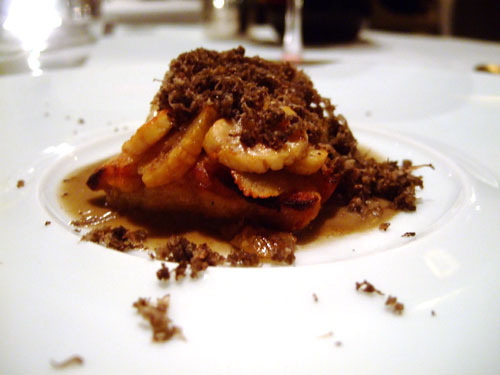 However, both Vongerichten and his customers understand that his reputation rests squarely on Jean Georges, the centerpiece of his culinary universe. 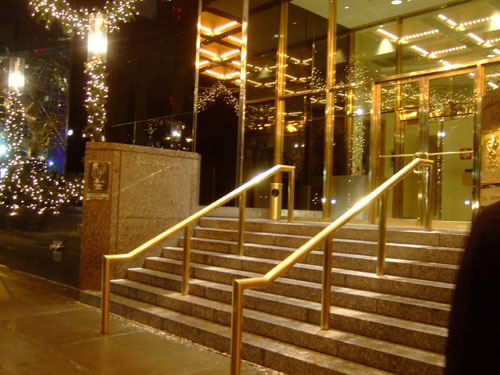 The restaurant is located on the ground floor of the 52-story Philip Johnson- and Costas Kondylis-designed Trump International Hotel and Tower, near the juncture of Columbus Circle and Central Park. Adam Tihany conceived the taupe-tinged space (reminiscent of TRU in Chicago), which is divided into two dining areas: the 70-seat Jean Georges (pictured above and the focus of this blog) and Nougatine, a more casual eatery next door. Outdoor dining is available on the Mistral Terrace, an even more casual establishment. 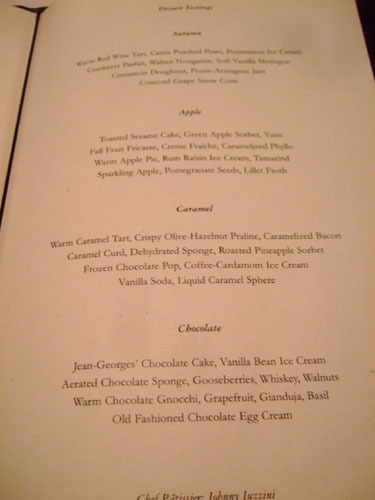 Here we have Jean-Georges' dinner menu. A four-course prix fix menu option is available, but we chose to try both the Autumn Menu [$148.00], composed with seasonally-available ingredients, and the Jean-Georges Menu [$148.00], constructed of Vongerichten's signature dishes. Jean Georges also offers a prix fix lunch, which I hear is quite a steal. 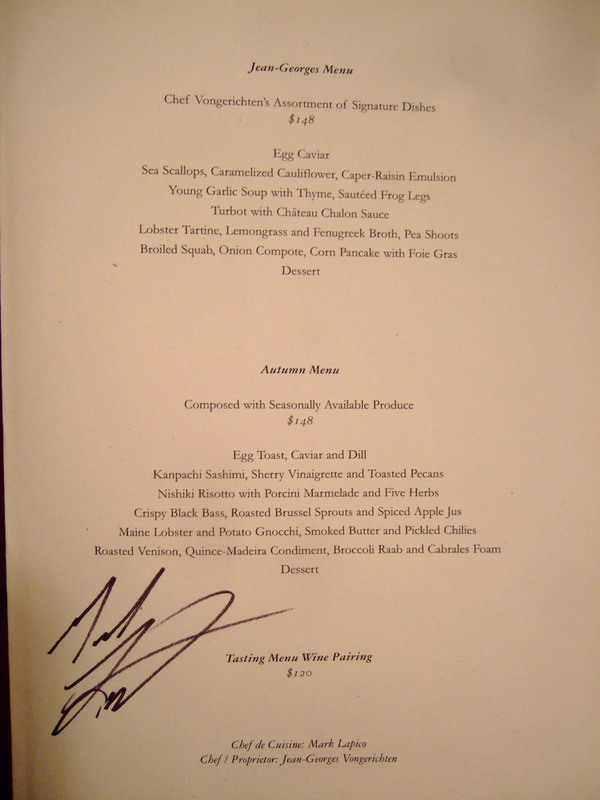 Note the signature of Chef de Cuisine Mark LaPico. Click for larger versions. 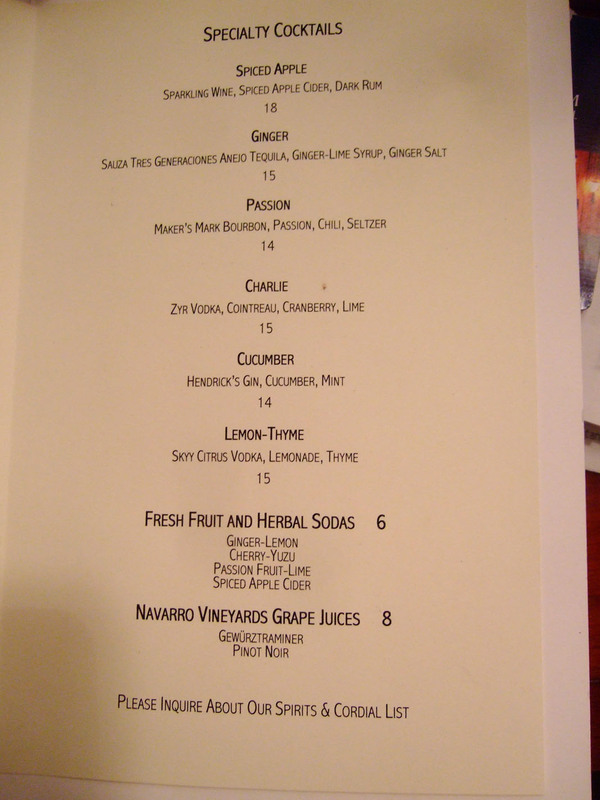 The wines by the glass and specialty cocktails menus are shown above. Prices are fairly reasonable given the stature of the restaurant, and I appreciated the offering of smaller 3oz tasting portions of wine. Click for larger versions. 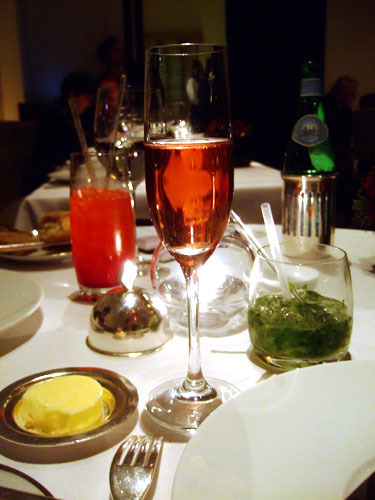 Guy Charlemagne, Brut Rosé, Mesnil-Sur-Oger NV [$14.50/3oz] - Light, dry, and slightly austere. 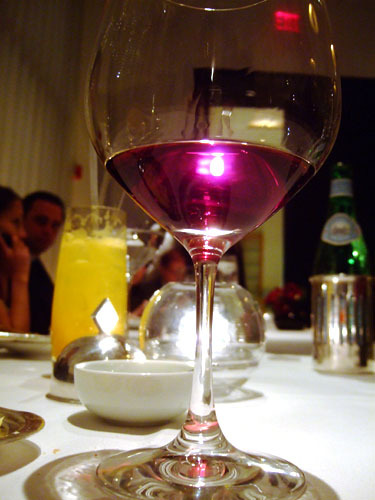 Beautiful ruby color with strawberry and lemon on the palate, layered on a minerally base. Perhaps a bit simplistic, but it works. Côte de Nuits-Villages, Louis Jadot Le Vaucrain, Burgundy, France 2005 [$9.00/3oz] - A straightforward, approachable Burgundy. I noted plenty of light red fruit, cassis, smoke, and spice, on top of a tart, tannic backdrop. A little closed, this could probably benefit from some more age. I had high hopes for the bread service, but the duo of a French roll and a sourdough rye seemed uninspired, especially in this setting. 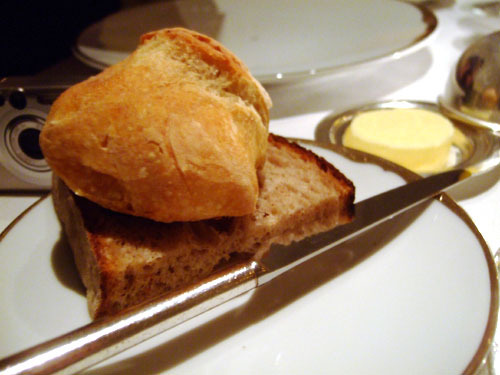 Compare this to the seven types of bread I was offered at Le Bernardin. A trio of amuses to kick things off. First up was the soup. The nose was nondescript, but the flavor was rich in cauliflower on the attack, while the finish was tangy and a bit spicy--I rather liked it. The salmon, meanwhile, was a fairly standard preparation save for the piquancy of cilantro--tasty but typical. Finally, we were given a slice of clementine, a tangerine-like citrus fruit--I figure it was supposed to be sweet and spicy, but I didn't really get it. 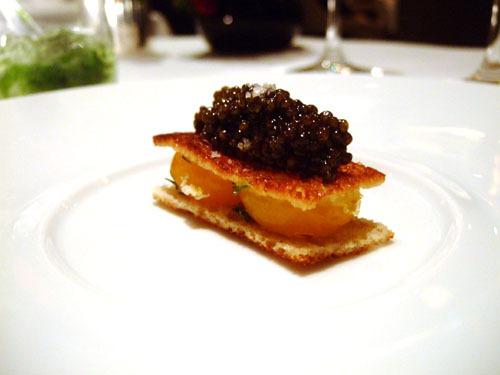 Unfortunately, the salty tang of caviar was lost amongst the heaviness of the egg and toast, which really was the focus here. 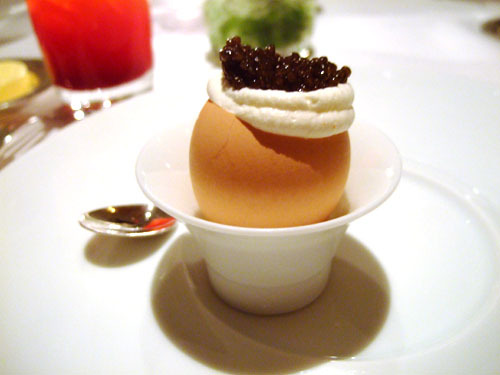 Though still tasty, the flavors were a bit muddled and the dish was outclassed by the corresponding Egg Caviar course. I've had several variations of this dish throughout my dining adventures, but this was easily one of the best interpretations. I noted an absolutely lovely temperature and texture contrast. First was the warm creaminess of egg, then the coolness of crème fraîche, finally ending with the zest of caviar and even a bit of spice. Excellent. The presentation here was interesting to say the least. 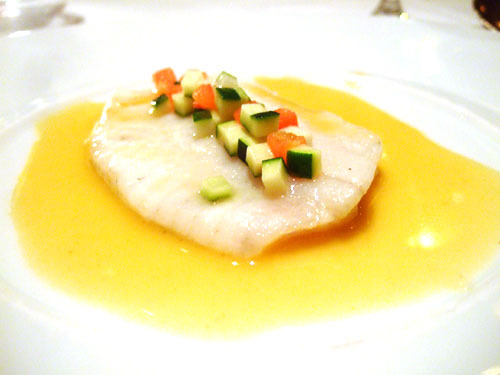 The kanpachi, or greater amberjack, formed a competent sashimi on its own, augmented by the pungency of the sherry. However, the key was the pecan "dust." 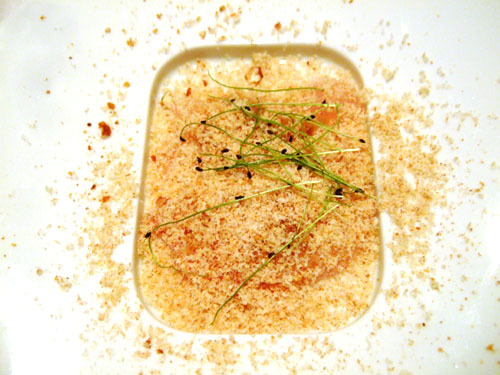 Though not particularly strong in flavor, the dust added a fanciful "fluffiness" to the dish that was positively unique, though one could also argue that it distracted from the fish. The scallops were just a bit firmer than I prefer, but still quite tender. I've not had them paired with cauliflower like this before, but the combination worked very well. 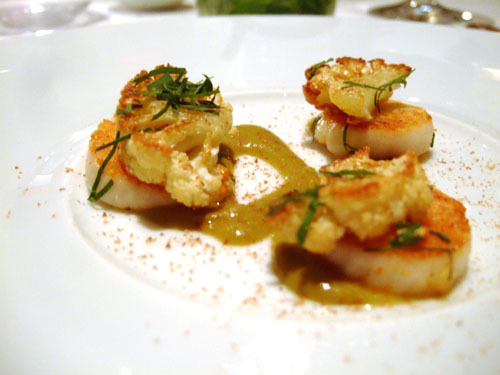 The crunch of the cauliflower played nicely with the scallops, and their vegetal flavor complemented the mild saltiness of the mollusks. The caper-raisin sauce, meanwhile, was rather tart, but provided a platform that linked everything here together. 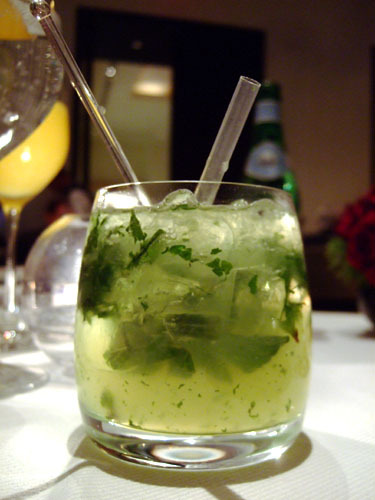 "Nishiki" refers to Yamada Nishiki, a short grain Japanese rice commonly used to brew sake. 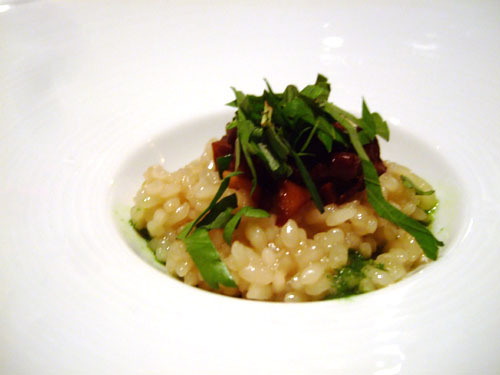 A light and bright risotto, the rice here was a bit firmer than I like unfortunately. 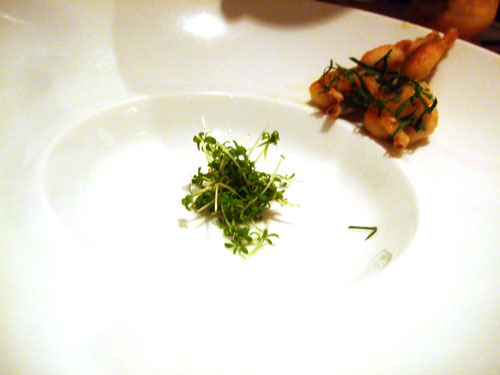 The dish's main flavor was the porcini, and while tasty, I would've liked the herbs to have been more apparent. The soup was surprisingly light, and even a bit sweet; the garlic was there, but didn't dominate at all. I rather liked the frog legs, which tasted like chicken (clichéd I know) and added some much-needed weight and savoriness to the course. Quite nice. 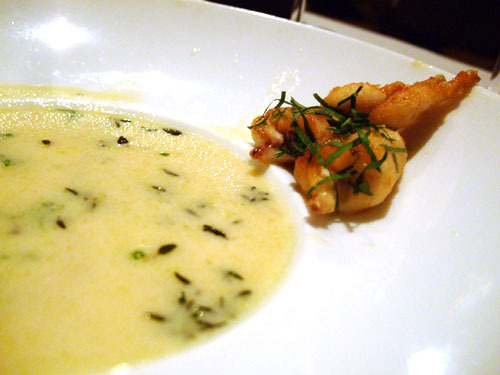 A finger bowl with a lovely citrus scent was brought out after the frog legs--definitely a classy touch. Unfortunately, the skin was hard rather than crispy, despite appearances; the bass at Le Bernardin was much better in this regard. Interestingly, I tasted chocolate in the fish (which otherwise was fairly straightforward), though this was tempered significantly by the potato purée and the Brussels sprouts, which were superb. Château Chalon refers to the Savagnin-sourced vin jaune wines from the Jura region of France. The sauce thus had a slightly wine-tinged flavor, but was also quite rich and "eggy", though mild. 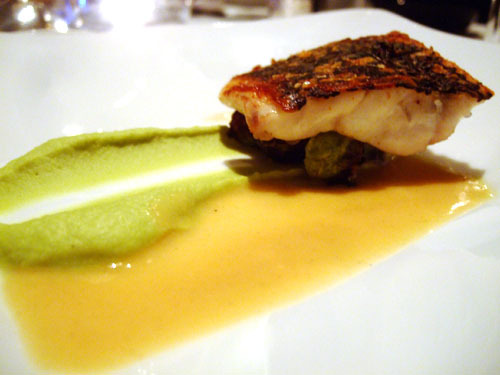 It added some well-placed color to the turbot, which was nicely tender, though a bit boring; it actually reminded me the skate at Le Bernardin. Meanwhile, the vegetables placed atop the fish went a long way in adding some textural contrast to the dish. 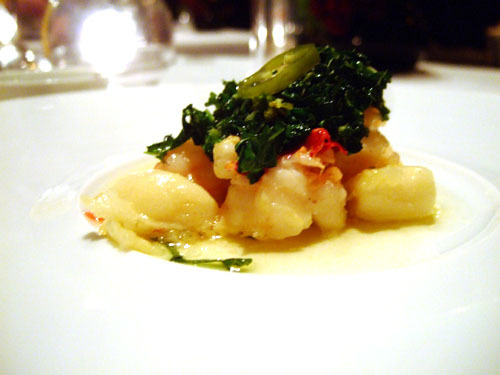 The lobster was a tad tougher than I would've liked, while the gnocchi were a touch softer. I liked the spiciness of the chilies and the bitterness of the greens, but would've liked their flavors to have been brighter. Overall, not a bad dish, but a forgettable one. This lobster dish was much more tender, and much better I thought. The use of lemongrass and fenugreek gave the dish a fantastic Indian-style flair, while the pea greens added a light vegetal and minty flavor. Delicious. Tasting this dish was like tasting the very marrow of autumn. The sweetbreads were softer than usual, and quite powerful in their gamy essence. In fact, they were dominant over the truffle, which didn't come to the fore taste-wise, but rather served more as an aromatic component. Unfortunately, I felt the use of chestnuts was far too liberal here, as their crunchy texture and nutty flavor stole attention from everything else in the dish, sinking what could've been a phenomenal course. 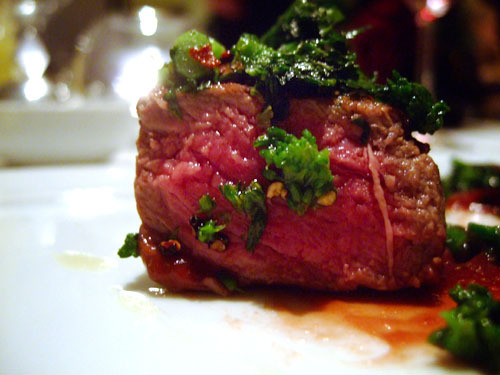 The meat almost reminded me of a hybrid of beef and lamb; it was lean, without pronounced marbling, yet still tender. Its pairing with bitter, peppery, minty broccoli raab (which, by the way, isn't broccoli at all) worked extremely well. However, I found the quince-Madeira sauce too sweet and cherry-like in nature, and thus avoided its use. The bird was nicely cooked, juicy, and tender. Unfortunately, I felt that it was overspiced--I noted far too many notes of cinnamon and anise for my tastes. 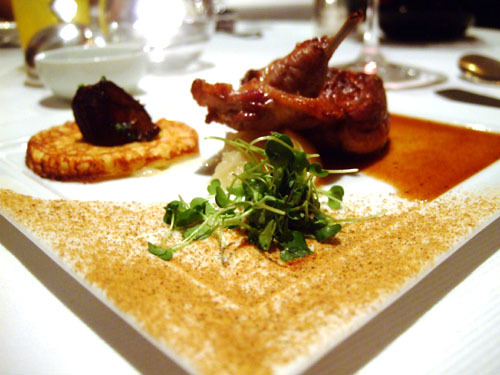 As for the foie gras, it was a fairly typical seared presentation, with an unctuous, heavy richness that was tempered somewhat by the corn pancake on which it sat; its pairing with the squab was a bit of a stretch for me. 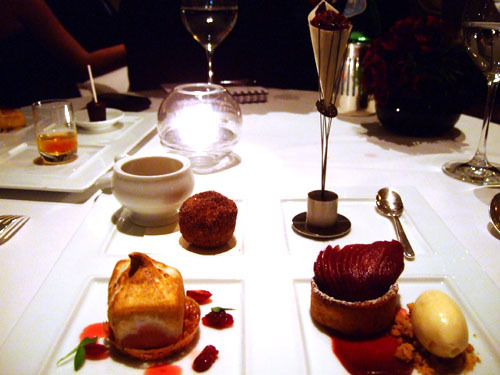 For dessert, you're presented with Chef Pâtissier Johnny Iuzzini's choice of four "themes," each with four small components. 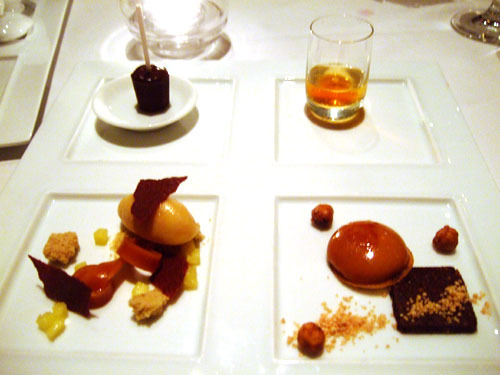 We chose "Autumn" (to go along with the Autumn Menu) and "Caramel." Click for a larger version. 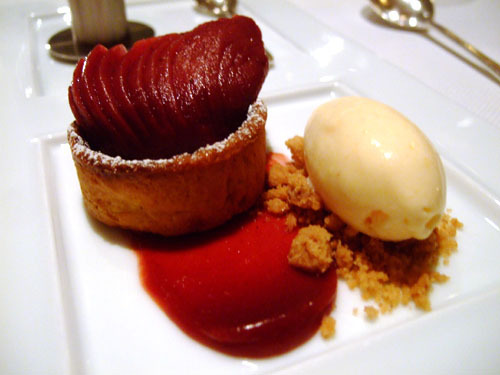 Warm Red Wine Tart, Cassis Poached Pears, Persimmon Ice Cream - The buttery, crumbly tart was quite tasty on its own, and was well-accented by the tartness of the poached fruit, which was then counterbalanced by the creaminess of the ice cream. 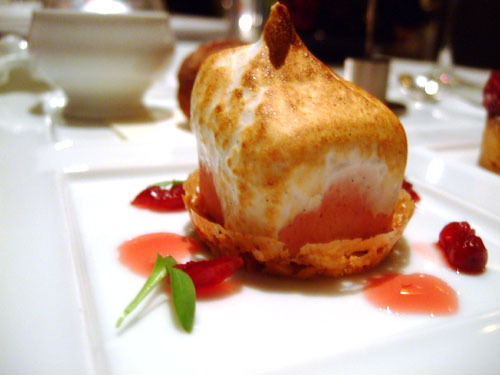 Cranberry Parfait, Walnut Nougatine, Soft Vanilla Meringue - The flavor here wasn't what grabbed my attention. Rather, it was an interesting study in textural contrast--between crunchy, hard nougatine and parfait, and between the parfait and the airiness of the burnt meringue. 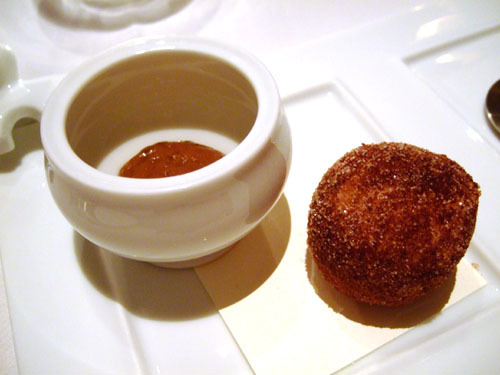 Cinnamon Doughnut, Prune-Armagnac Jam - The overall effect of the pastry and jam was not dissimilar to that of eating a jelly-filled doughnut. Simple, but effective. 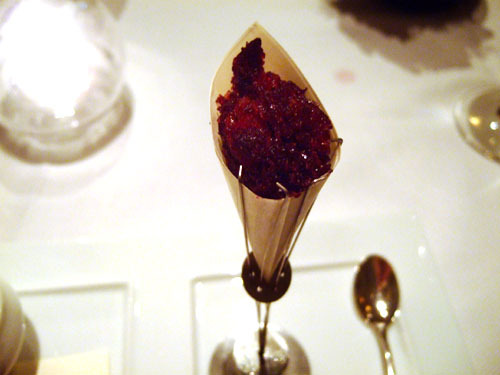 Concord Grape Snow Cone - A classy take on a childhood favorite, this was indeed like a grape snow cone, or to be more sophisticated, a grape granité. 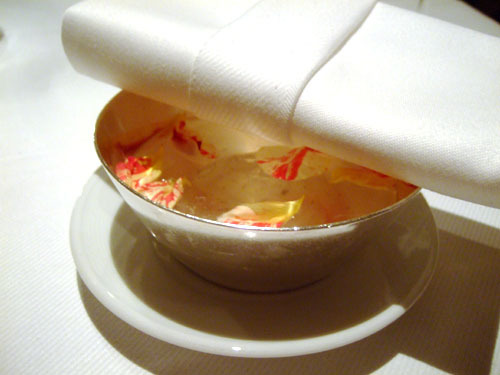 Note the unique piece of serviceware (called "Squid"), which was created for use at Alinea in Chicago. 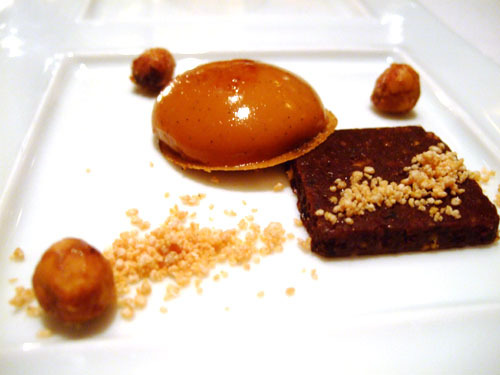 Warm Caramel Tart, Crispy Olive-Hazelnut Praline, Caramelized Bacon - The caramel here was extremely light, and went rather well with the smoky, nutty praline and crunchy whole hazelnuts. Unfortunately, the bacon component wasn't really apparent. 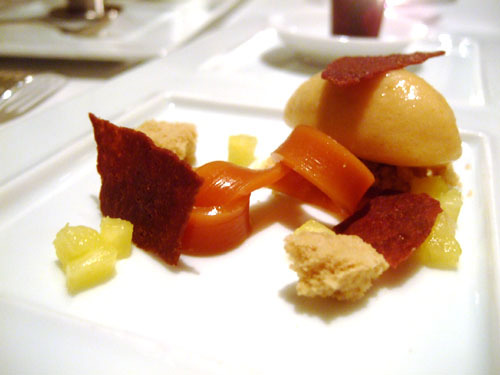 Caramel Curd, Dehydrated Sponge, Roasted Pineapple Sorbet - The caramel "noodle" really took back seat to the sorbet, which, despite being pineapple, had a distinct "peachiness" to it. Both items were nicely contrasted by the sponge and crispy tuiles. 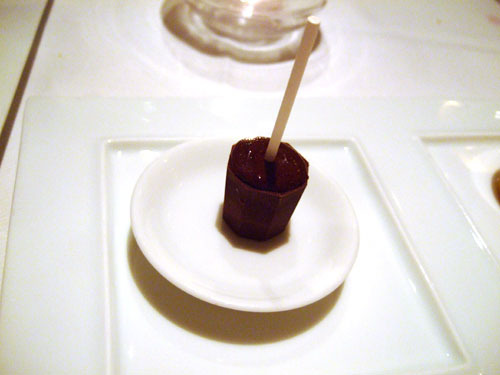 Frozen Chocolate Pop, Coffee-Cardamom Ice Cream - A surprisingly hard chocolate shell surrounds a filling of ice cream. Tasty, but I really didn't detect much caramel here. Vanilla Soda, Liquid Caramel Sphere - This was certainly the most memorable of the desserts--a caramel spherification in a vanilla tincture. 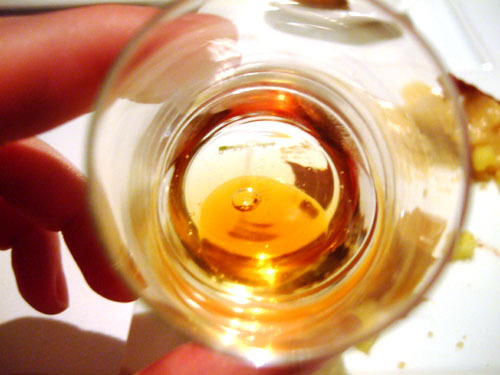 The result was an astringent, herbal, medicinal flavor with just a hint of caramel. Not entirely pleasant. 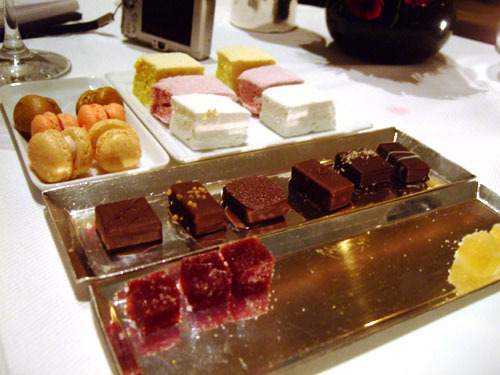 After dessert, a myriad of mignardises were brought to the table: ginger, pomegranate, and chestnut macarons; vanilla, raspberry, and banana marshmallows; raspberry-beet and apple gelées; and an assortment of chocolates. Overall, a competent, though not particularly exciting, spread. For the most part, the cuisine was "vibrant" and "spare," as advertised. 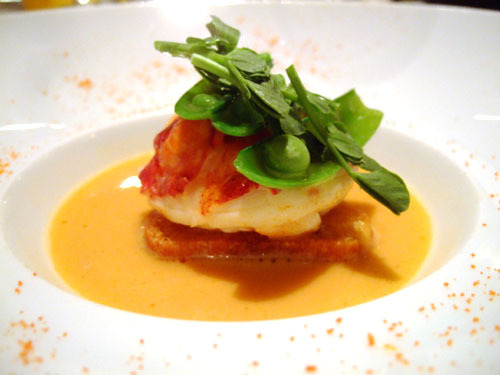 The food was light, yet bold, and certainly not lacking in flavor, traits I thought were especially apparent in the Lobster Tartine, Sea Scallops, and Young Garlic Soup dishes. 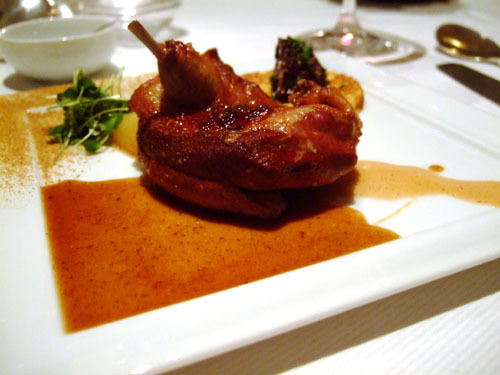 So despite Vongerichten's absence in the kitchen at Jean Georges, I'm happy to report that the food has held up just fine, though certainly the place had its share of misses--the Broiled Squab and Sweetbreads were the most notable disappointments. Nevertheless, I did enjoy my dinner here, and as with Le Bernardin, any mistakes were not egregious enough to threaten the meal as a whole. So Chef Vongerichten--it looks like your empire is secure...for now. Great post. Some of the dishes look similar to ones I've had at Melisse. Except for the "Cauliflower Cumin Hibiscus Soup". I just know I'm going to obsess about finding a recipe for the Cauliflower Cumin Hibiscus Soup!! Great review and pictures! We were in Jean Georges in the end of September and had a very similar menu. It was great! p.s. question for you - did you do anything special when you posted your blog on foodbuzz for it to say on the top 'check out Jean Georges'? 5 Star Foodie: Thanks! I think to get the "Check out," you just need to specifically post your blog attached to a restaurant. Definitely worth a try Annie! Another three-star. Can't get enough! Nice review. Very well-designed plating and presentation. Thanks! I agree about the presentation. 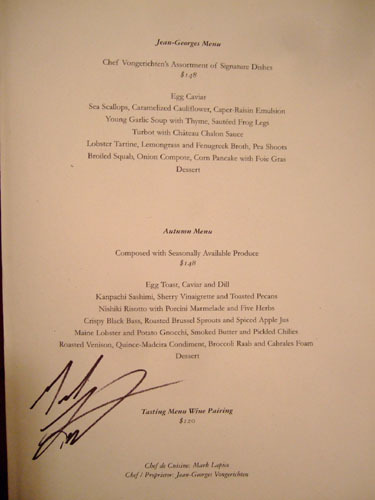 Kevin, i just read your review of Melisse on Chow.com. How do you compare your JG experience with that? I'm going to NY in 3 weeks. 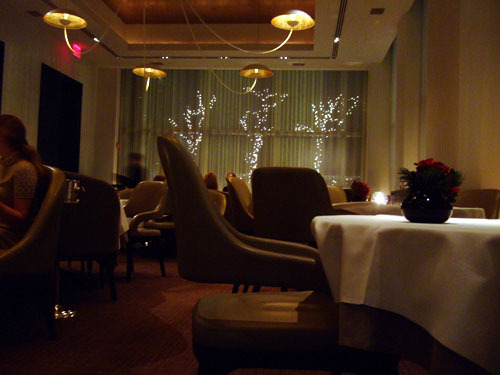 I'm having a dinner at Le Bernardin. Am wondering if I should do JG also. 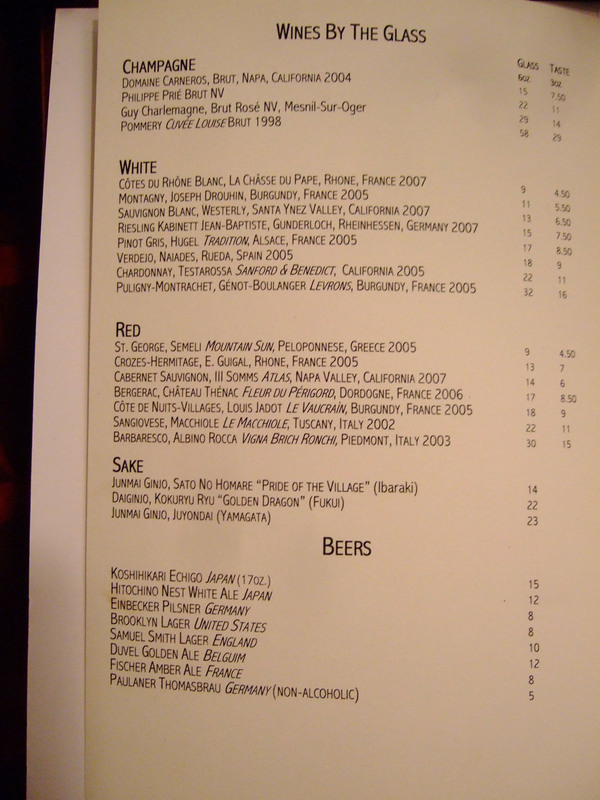 I'd give the edge to Jean Georges, though the difference certainly isn't huge. 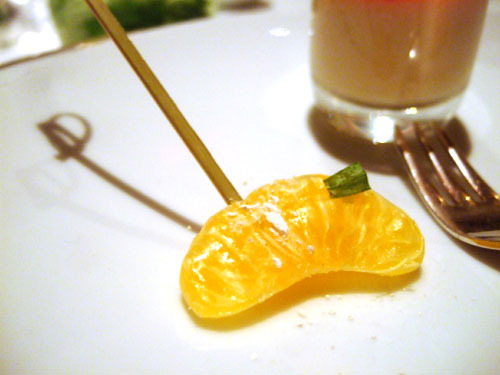 Out of all the restaurants I tried in NY, Per Se was still the best, but even it didn't blow me away sadly. 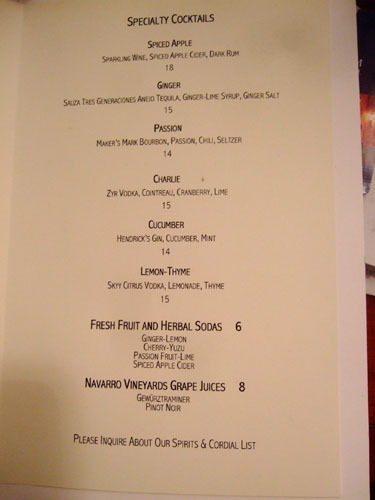 I did Per Se a few years ago when they first opened, and TFL last year. Neither blew me away. Guess I am not a big fan of TK. The cuisine is certainly good but, to me, quite predictable. I can't believe how easy it is to get reservations now in NY, unlike my previous visits. I can almost get any place at any time I want (except Per Se of course). 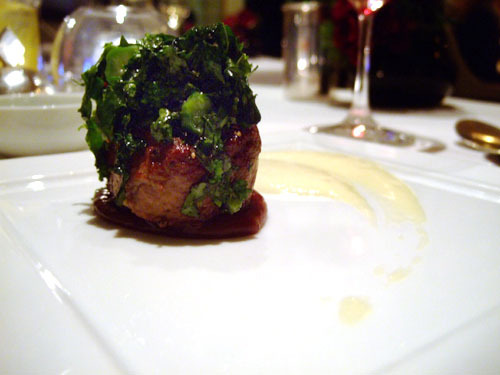 I have a standing reservation at Jean Georges for a pre-opera dinner so I'll see if I feel like going. 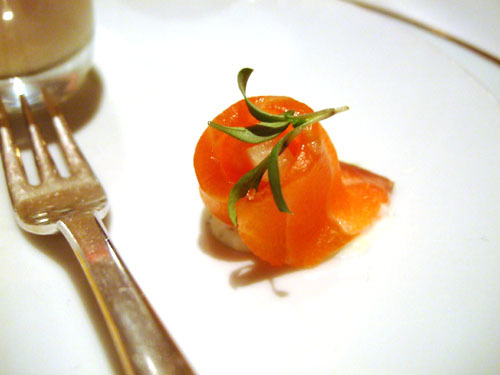 French Laundry was a bit of a revelation for me, but my meal there was a while ago, when I wasn't as "experienced." Sadly, if I were to go today, I likely wouldn't enjoy it as much. So jaded...sigh. I hear it's slightly easier to secure reservations now though, on account of the recession. 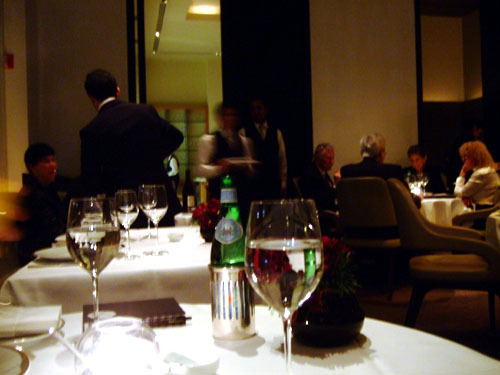 Le Bernardin is a good choice. Though I didn't think so at the time, I may actually prefer it to Jean Georges. Had an outstanding lunch there, both in September and October 2010. Beautiful room and loved the windows on both sides,(sat at table 10). 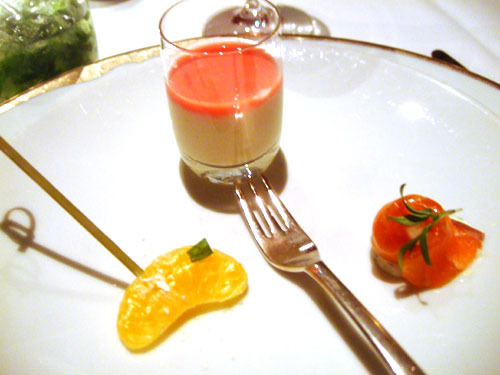 In additon, they are so very generous in the amuse and mignardises they offer which was impressive. Only $68 for the 3 course lunch special - unbelievably good value! Annie, I've heard amazing things about the lunch at JG. Looks like you're in agreement! I am impressed by a beautiful photograph of your blog and a wonderful explanation. 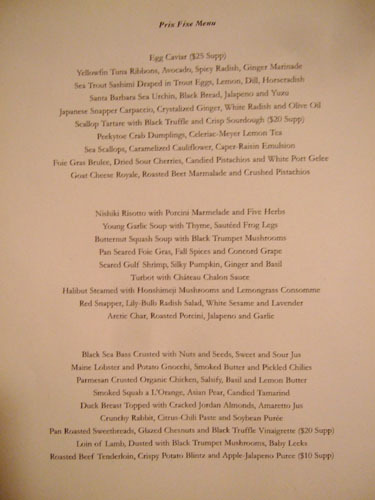 I live in Nagoya, Japan, and I went to Jean Georges Oct. 2008. It was dark and not beautiful though also had taken the photograph of the dish also by me. Sounds like you went right before me. Your photos posted anywhere? Looks like we had some of the exact same courses. What kind of camera were you using? My camera in SONY Cyber-shot. These photos were shot with a Fuji FinePix F30, but I'm currently using a Sony as well, the a500 DSLR.